This page is most useful for playing Special Card Roulette and Special Card Showdown (check out the Gameplay Variations page for other ways to play Uno). I will be sure to update this list as I get new editions of Uno cards. Here is the printer-friendly version of this list that can be used quickly as an in-game reference. If you want to see a list of all existing Uno versions, check out the Uno Editions page. If you are interested in purchasing any of these Uno sets, clicking the name of the theme will take you to the Amazon.com listing for that item (if available). If you are just looking for cheaper Uno sets, check out my affordable Uno cards list. Or, if you are feeling especially generous, feel free to check out my Uno Wish List (where you can purchase Uno sets and have them sent to me). Thanks for your support! Angry Birds (King Pig Card): Choose a color. All other players must take turns drawing cards until a player draws a card of the selected color. You then choose the color of play. 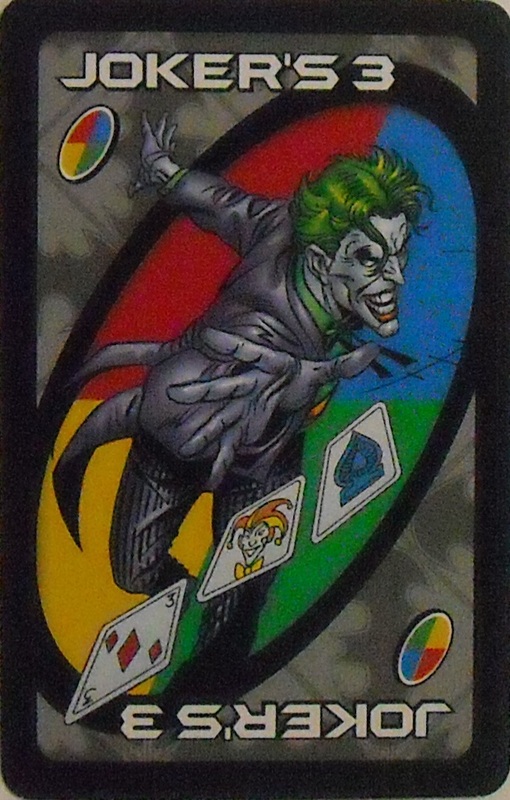 Batman (The Joker's 3 Card): You have a total of 3 cards to make other players draw. You may distribute these cards in any manner (i.e. 3 cards to 1 person; 1 card to 3 people; etc.). Care Bears (Care-A-Lot Card): After this card is played, all players (in play order) get to play any card from their hand, ending with the person who played the Care-A-Lot card. The cards played during this time do not have any effects and do not need to be normally playable on the top card of the discard pile. After all players have discarded a card, the player who played the Care-A-Lot card chooses the color of play. Cars (Victory Lap Card): All players pass their cards facedown in the direction of play. The person who played the card looks at the cards passed to her and decides whether to keep the cards or pass them. This process continues until the person who played the card keeps the cards in front of her or gets her cards back. She then chooses the color of play. Cars 2 (Special Agent Mater Card): When you play this card, you may look at every other player's hand. Chicago White Sox (Manager Card): Call out a card that you want (e.g. Draw 4). You may then trade any card in your hand for that card from any or all players that have it. Cinderella (Prince Charming Card): When a Draw 2 or Draw 4 is played against you, use this card to make you invincible and block the effect. Diary of a Wimpy Kid (Cheese Touch Card): All players (including the person who played this card) show the other players all of their yellow cards. Any player with yellow cards must draw 2 cards. The player who played the Cheese Touch Card then chooses the color of play. Disney Channel (Behind the Scenes Card): Give away all of your cards of one color to the other players by giving a card to each player in a clockwise direction until they have all been distributed. You may then choose the new color of play. Disney Princess (Classic) (Dragon Card): All other players must discard a 0 or 5 or must draw until they can do so. Disney Princess (Modern) (Curse Card): Choose a color. All other players must draw cards until they get a card of that color. You then choose the color of play. Disney Theme Park (Classic) (Evil Card): Use this card at any time during a game to steal the top card from the discard pile. You may then choose a color and play resumes as it was before the Evil card was played. Doc McStuffins (Stethoscope Card): All other players must show either a 1 or Draw 4 from their hand. All players who cannot do so must draw 2 cards. Eragon (Zar'Roc Card): Choose a player and look at his cards. You may take any one of his cards and give one of your own to that player. You may then choose the new color of play. Fraggle Rock (Travel Card): Look at any other player's cards and then choose the color of play. Frozen (Olaf's Summertime Card): You may discard up to three pink cards or up to three yellow cards. Glee (Sabotage Card): Choose a player and look at his cards. You may take any one of his cards and give one of your own to that player. You may then choose the new color of play. Hanna Barbera (PIC-A-NIC Card): Use this card at any time during a game to steal the top card from the discard pile. You may then choose a color and play resumes as it was before the PIC-A-NIC card was played. Hannah Montana (Best of Both Worlds Card): You may use this card either to make each of the other players draw 1 card or to block a Draw 4 card that is played against you. If you use it to block a Draw 4 card, you still get to take your turn and the color of play is the color that the player who played the Draw 4 card chose. Harry Potter (Voldemort Card): Discard all 2s, 6s, and 9s. The last card discarded determines the color of play. Hello Kitty (Hello Kitty Bow Card): All other players must show a red card from their hand. All players who cannot do so must draw 3 cards. Horses (Horseplay Card): Choose any two players to swap hands with each other. Iron Man 2 (War Machine Card): Use this card to block a Draw 2 or Draw 4 card. The person who played the Draw 2 or Draw 4 card against you must draw those cards instead of you. John Deere (Harvest Card): Choose a player to draw cards until she either draws a green card or draws five cards. If that player draws a green card, she plays it and play then continues. If she does not draw a green card, the player who played the Harvest card chooses the color of play. Kung Fu Panda (Kickin' Battle Card): Choose a player to battle. Both players play a card and the higher card wins (non-number cards are treated as 0s). In the event of a tie, the cards are set aside and both players play another card (if a player runs out of cards during the battle, he draws a card to play). The loser of the battle picks up all battled cards plus 2 cards from the draw pile. Macy's Thanksgiving Day Parade (Wishbone Card): Choose a player to "pull the wishbone" with. Both players play a card and the higher number wins (non-number cards are treated as 0s). The loser then draws cards equal to the numerical difference between the two cards. If the Wishbone Card is the only card that you can play after playing a Wishbone Card, you win the round automatically. Marvel Avengers Assemble (S.H.I.E.L.D. Card): When a Draw 4 is played against you, use this card to block the effect. You then choose the color of play and take another turn. Marvel Heroes (Feats of Fate Card): Trade any card in your hand with a Draw 4 or Draw 2 from the player to your left. If that person does not have either of these cards, move onto the next player. Continue this until you get a Draw 4 or Draw 2 card. If you receive a card, choose the new color and resume play. If you don’t receive a card, you may play a second card. That card determines the color of play. National Parks: Ken Burns (Save The Parks Card): When a Draw 2 or Draw 4 is played against you, use this card to make you invincible and block the effect. New York (Skip Everyone Card): Skip everyone and take another turn immediately after playing this card. Nightmare Before Christmas (Oogie Boogie Card): Choose a player to draw cards until he draws cards totaling 11 or higher (only number cards count towards this total). The player drawing cards must show the other players all number cards he draws, but may place non-number cards directly in his hand. Once the player draws enough cards, that player places the last card he drew on the top of the discard pile. The player who played the Oogie Boogie card then chooses the color of play and play resumes. Nintendo (Power Card): When a Draw 2 or Draw 4 is played against you, use this card to make you invincible and block the effect. Over The Hedge (Trap Card): Choose a color. All other players must draw cards until they get a card of that color. The chosen color is the new color of play. Penguins of Madagascar (Dr. Blowhole’s Revenge Card): You have a total of 4 cards to make other players draw. You may distribute these cards in any manner (i.e. 4 cards to 1 person; 2 cards to 2 people; etc.). Phineas and Ferb (Agent P Card): When a Draw 2 or Draw 4 is played against you, use this card and the person who played the Draw 2 or Draw 4 has to draw those cards instead. Pirates of the Caribbean (Dead Men Tell No Tales Card): When you choose a color, all other players must draw until they get a card of that color. Planes (Franz Card): When a Draw 4 is played against you, use this card to block the effect. You then choose the color of play and take another turn. Pokemon (Trainer Card): You have the option to trade all of your cards for all of an opponent's cards. Whether you trade or not, you also choose the color of play. Ratatouille (Recipe for Chaos Card): Call out a number. All other players must discard a card of that number or draw 3 cards. Sesame Street (Grouch Card): You may give away up to three cards from your hand to other players. You may distribute these cards in any manner (i.e. 3 cards to 1 person; 1 card to 3 people; etc.). If you fail to say "Uno" while distributing the cards (if you get down to one card or fewer), you must take back the distributed cards and draw 2 additional cards. Shrek (Merlin Card): When you choose a color, all other players must draw until they get a card of that color. Sofia the First (Cute 'n' Cuddly Card): When a Draw 4 is played against you, use this card to block the effect. You then choose the color of play and take another turn. Spider-Man Spider Sense (Spider Sense Card): All other players must show either a 9 or Special Wild Card from their hand. All players who cannot do so must draw 2 cards. SpongeBob Squarepants (Secret Recipe Card): Look at any other player's cards and then choose the color of play. Superman Returns (Kryptonite Card): All other players must immediately play a green or Wild card or draw 3 cards. The person who played the card then chooses the color and play resumes. Texas (Last Stand Card): You may use this card at any time during the game to switch hands with any player who only has one card left. The player using this card then chooses a color and play resumes where it was before the Last Stand card was played. Toy Story (The Claw Card): The next player draws cards until she gets a 1, 2, 3, 4, or 5 card. She also loses her turn. Toy Story 3 (Lotso Card): Choose a color. All other players must show you a card of that color or draw 3 cards. If all players have a card of that color, you must draw 3 cards. The color chosen becomes the color that continues play. Uno H2O (Wild Downpour Card): All other players must draw 2 cards. As an Amazon affiliate, I earn a small commission for any purchase made through any of the links on this page. Thanks for your support!